10 Grams Bag of Japanese Seed Beads. The Size, Manufactures Number and Color are listed in the title. 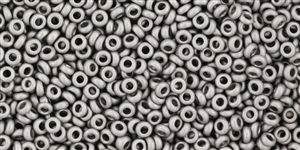 11/0 Demi Round Beads are approx 2.2mm in diameter x .9mm. Introducing the latest seed bead shape innovation, the Demi Round™ from TOHO BEADS launched in 2016. Available in sizes 8/0 and 11/0 The Demi Round™ is more than a shape; it is a new concept in seed beading. Developed by TOHO in collaboration with Starman, the Demi™ is a thinner version of the traditional round seed bead with the same hole size and diameter. This exclusive innovation is made possible by the quality glass cane and precision cutting of TOHO manufacturing. The Demi™ works flawlessly with all of the popular stitches in new and exciting ways. Its versatile shape allows artists to create high definition designs with enhanced color depth and detail. The thinner profile of the Demi Round™ creates a new texture within designs.